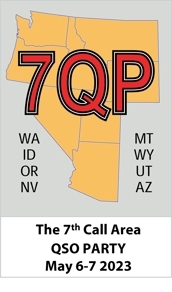 K7AUO, the TERAC group operated again this year from the abandoned radar base near the town of Condon in Gilliam County, Oregon. Our attempt to evaluate our new 40-Meter vertical was somewhat thwarted by a high noise level on that band. The weather was great while we tore down and packed up on Sunday, but cold, wet and windy the rest of the time. That notwithstanding, we hope to see you next year. EXP14 ready to be tilted up. Our antennas: the 40 Meter vertical and EXP14 tri-bander. Moonrise over our new 40 Meter vertical. Where did all the noise on 40 Meters come from on Saturday night? Bob/W7BKN and Joe/AE7LD operating in the cold and cramped Condon Base Exchange building. Temperature got up to 60 F!